PETALING JAYA (Nov 21): Sime Darby Property Bhd’s latest launch in Subang Jaya, Lot 15 serviced apartment, has achieved a 64% take-up rate of its 204 units for sale during its weekend launch on Nov 18 and 19. According to the developer, 130 out of 204 units offered at the weekend launch were taken up by purchasers, reflecting good demand for the newest residential property in the RM4 billion Subang Jaya City Centre (SJCC). Located on a 2.22-acre freehold plot, Lot 15 comprises two 20-storey serviced apartment blocks with a total of 361 homes and three levels of retail units. The project has a GDV of RM269.2 million. Prices for the serviced apartment units range from RM593,888 to RM1 million, while built-ups range from 624 sq ft to 1,001 sq ft with layout types ranging from 1+1 bedrooms to 2+1 bedrooms. “This is a great start for the development and we are humbled by the good response. “It shows that there is significant demand for properties in good locations such as the SJCC that offers existing and planned modern facilities, transportation links and good accessibility. 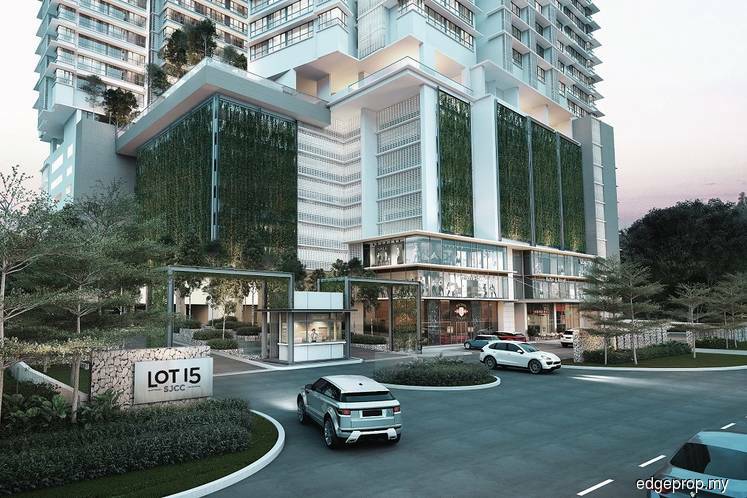 “Lot 15 is a development that reflects the true spirit and culture of Subang Jaya and writes a new chapter in the township’s long successful history,” said Sime Darby Property managing director Datuk Seri Amrin Awaluddin in a statement today. Facilities of Lot 15 include a floating pavilion, swimming pool, Jacuzzi, children’s pool, multipurpose hall and deck, gymnasium, sauna room, BBQ area, playground, sky gardens and rooftop edible herb gardens. Lot 15 is a “transit adjacent development”, an interconnected development with facilities and amenities within close reach. It is a 500m walk away from Subang Jaya LRT station and is accessible via Federal Highway, New Pantai Expressway (NPE), Damansara-Puchong Highway (LDP), New Klang Valley Expressway (NKVE) and Shah Alam Expressway (KESAS). Sime Darby Property is also offering free legal fees on Sale and Purchase Agreements (SPA) and disbursement, free loan legal fees and disbursement as well as free maintenance fees for 12 months. A special additional discount of up to 3% is also available for Sime Darby Property PRIME members. PRIME is a loyalty and reward programme offered to Sime Darby Property homebuyers.